The process of filing legal based documents can often be a tedious and complicated process. Rather than risking their service requests and documents being rejected by government agencies, many people seek out the assistance of trained professionals. 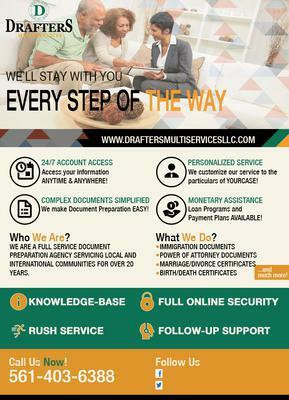 Drafter Multiservices is a Full-Service Document Preparation provider that has been assisting individuals, national and international, with researching and preparing various documents for multiagency and government approval for over 20years. We offer both online and offline document preparation services. Secondary Numbers: 323-451-1692 or 561-752-7345.